When I agreed to go to church on Christmas Eve, this isn't exactly what I had in mind. However, we were experiencing a less-than-traditional Christmas by spending it away from our family, in a hotel in the Algarve. We had heard about the Capela dos Ossos (Chapel of Bones) in Alcantarilha and worked out that it was about 20 minutes drive away from where we were staying. Alcantarilha is a beautiful, traditional Portuguese village full of colourful houses on winding, steep roads that are just wide enough for one car to drive down. The cafes and bars display local sporting trophies and team photos and everyone knows everyone. 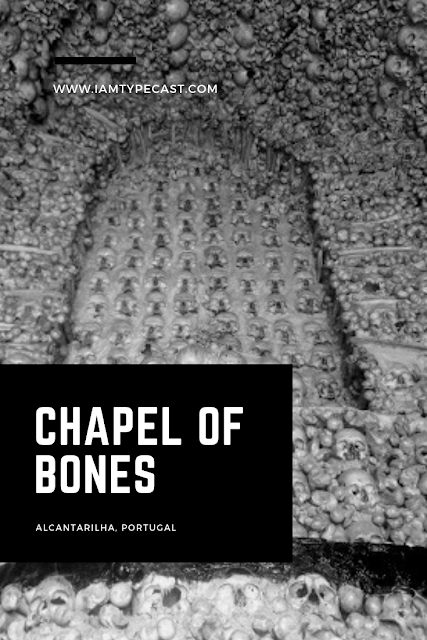 But right at the top of the main street, next to the main church, is the Capela dos Ossos - built in the 16th Century, the walls are covered in thousands of bones and skulls from the old churchyard cemetery. There is supposed to be a wooden cross displayed on the small altar however that wasn't there on the day we visited and I'm not sure if it has been removed permanently. It may seem a bit macabre but it's not really gory - especially when you find out that it was built to preserve the remains of their dead. There are a few boards outside the chapel which detail the local history - a really interesting read. The church was also erected in the 16th Century and the altar displays an 18th Century wooden sculpture of Nossa Senhora da Conceicao (the Immaculate Conception). Advice : The chapel is in a small village about 20-30 minutes drive outside of Albufeira. We were expecting it to be the size of a church but it is very much an annex next to the main Catholic church. This isn't a day trip out - more of an hour's mooch around in an afternoon - however the village is very picturesque - so visit if you decide to hire a car and have a drive around the region. Alternatively, it will cost approximately €20 each way in a taxi.